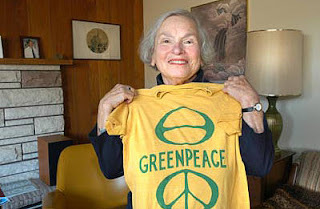 Dorothy Stowe, who died last July, holds up an original Greenpeace T-shirt inside the Point Grey home that served as the organization's first headquarters. BELOW: Barbara Stowe sits beneath a tree at the family home. Globe and Mail photograph by Jeff Vinnick. For sale: Family home on quiet corner lot; rear deck with city and mountain views; estate sale. A Vancouver Special in more ways than one. An ordinary, two-story, wood-frame house in Vancouver’s leafy Point Grey neighbourhood was put on the market this week, listed at $1.688 million. The price tag is less an eyebrow-lifter than the house’s history, for it was here, at 2775 Courtenay St., that Greenpeace was born. The owners, Dorothy and Irving Stowe, held countless meetings in their living room. This was where the city’s anti-establishment gathered — rebels and hippies, Quakers and Buddhists, draft dodgers and peace mongers, radical journalists and rainbow warriors. They came to save the planet, as well as to sample Dorothy’s cooking. Tea and cookies were served at Greenpeace meetings. while joints were passed around on the deck. Smoking was banned inside the home. Talks about protesting an underground nuclear test on Amchitka Island in the Alaskan Aleutians led to the formation of a group called the Don’t Make a Wave Committee. This eventually became known as Greenpeace, the city’s contribution to world politics. For a few years, the group’s original headquarters were based on the ground floor of the family home. Some background on the house’s story has been included as part of the staging for the sale. Lookyloos and prospective buyers can check it out during an open house to be held on Saturday and Sunday afternoon. The home is for sale following the death last July of Dorothy Stowe, aged 89. Irving Stowe died of pancreatic cancer in 1974, aged 59. The death of a parent brings with it responsibilities for handling the estate. For the Stowes’ children, Robert, a neurologist and neuropsychiatrist, and Barbara, a writer, the listing of the family home has not been easy. The Stowes bought the home in 1968, not long after moving to Vancouver from New Zealand. Irving Strasmich and Dorothy Rabinowitz, both from Rhode Island, took as their surname Stowe in honour of Harriet Beecher Stowe, the abolitionist author of Uncle Tom’s Cabin. The couple spent their wedding night at a fundraising dinner for a civil-rights group. Not long after moving in, the family played host to a party in which the theme for the post-Summer of Love soiree was to dress as hippies. It was not long after that the home became a hangout for the real thing. Irving, who had a strong interest in jazz and classical music, befriended the record reviewer of the Georgia Straight. Soon, the underground paper’s hirsute staff could be found at the Courtenay Street home lounging on sofas and on floor cushions while grooving to the latest releases from the likes of the Grateful Dead. In time, the Stowe living room became a second home to the likes of the Hunters (Robert and Zoë), the Bohlens (Jim and Marie), and the Metcalfes (Ben and Dorothy), all of whom would be instrumental in the founding of Greenepeace. In 1970, the folk singer Phil Ochs accepted an invitation to dinner. He was to perform that night at a fundraising concert, along with Joni Mitchell and James Taylor. As Mr. Ochs dined on lasagna, yippie hangers-on raided the family liquor cabinet (poorly stocked, as it turned out, as the Stowes were not big drinkers) while Trotskyite agitators harangued Irving about the prohibitive cost of concert tickets. The ducats cost just $3. Over the years, ecologists made a pilgrimage to the home, as did many musicians. When Bono of U2 visited Vancouver about six years ago, he insisted on meeting Dorothy. More recently, a pair of bamboo swivel chairs, as well as Irving’s old roll-top desk, have been donated to the local Greenpeace office. Rex Weyler, an ecologist and journalist who wrote a well-received history of Greenpeace, thinks the Stowe home should become an historical site. He’d like to see the home preserved as a testament to an era and to the city’s rich history of social activism. Would pretty amazing to say you owned the house where Greenpeace was born! The experience of reading this blog is entirely different from other blogs .This shows the relevance of this place in your life. So lucky of you to live on such a pretty place.